The third Challenge of the 2018 Challenge series is a 5 day challenge to celebrate Mathematics and Statistics Awareness Month. The challenge is being offered on the Extended Sierpinski Problem (LLR) application. Each April 55,000 mathematicians and scientists celebrate Mathematics and Statistics Awareness Month to increase public understanding and appreciation for mathematics and statistics. Starting in 2017 the month's theme is to celebrate mathematics and statistics and the diverse researchers and students in these fields who are contributing so much to furthering discoveries, solving problems, and finding beauty in our world. College, University and high school departments, institutional public information offices, math clubs, student groups, related associations and interest groups are urged to organize and host activities in April for Mathematics and Statistics Awareness Month. Past activities have included workshops, competitions, exhibits, festivals, lectures, symposia, department open houses, math art exhibits, and math poetry readings. Some years, elected officials have issued proclamations, frequently in connection with special meetings and events arranged to observe the month. To participate in the Challenge, please select only the Extended Sierpinski Problem LLR (ESP) project in your PrimeGrid preferences section. The challenge will begin 3rd April 2018 12:00 UTC and end 8th April 2018 12:00 UTC. Application builds are available for Linux 32 and 64 bit, Windows 32 and 64 bit and MacIntel. Intel CPUs with AVX capabilities (Sandy Bridge, Ivy Bridge, Haswell, Broadwell, Skylake, Kaby Lake, Coffee Lake) will have a very large advantage, and Intel CPUs with FMA3 (Haswell, Broadwell, Skylake, Kaby Lake, Coffee Lake) will be the fastest. Highly overclocked Haswell, Broadwell, Skylake, Kaby Lake or Coffee Lake (i.e., Intel Core i7, i5, and i3 -4xxx or better) computers running the application will see fastest times. Note that ESP is running the latest FMA3 version of LLR which takes full advantage of the features of these newer CPUs. It's faster than the previous LLR app and draws more power and produces more heat. If you have a Haswell, Broadwell, Skylake, Kaby Lake or Coffee Lake CPU, especially if it's overclocked or has overclocked memory, and haven't run the new FMA3 LLR before, we strongly suggest running it before the challenge while you are monitoring the temperatures. Please, please, please make sure your machines are up to the task. Those looking to maximise their computer's performance during this challenge, or when running LLR in general, may find this information useful. Your mileage may vary. Before the challenge starts, take some time and experiment and see what works best on your computer. If you have an Intel CPU with hyperthreading, either turn off the hyperthreading in the BIOS, or set BOINC to use 50% of the processors. If you're using a GPU for other tasks, it may be beneficial to leave hyperthreading on in the BIOS and instead tell BOINC to use 50% of the CPU's. This will allow one of the hyperthreads to service the GPU. Create a app_config.xml file in the directory C:\ProgramData\BOINC\projects\www.primegrid.com\ (or wherever your BOINC data directory is located). For a quad core CPU, the file should contain the following contents. Change the two occurrences of "4" to the number of actual cores your computer has. After creating the file, click on "Options/Read config files". You should then restart BOINC or reboot. The first time BOINC downloads an ESP task, it may act a little strange and download 4 tasks instead of 1. The run times on this first set of tasks may look a bit strange too. This is normal. This will also occur anytime BOINC downloads more than one task at a time. This can be avoided by setting "Use at most [ 1 ] % of the CPUs" before you download ESP tasks. After one task was downloaded, increase the percentage. Some people have observed that when using multithreaded LLR, hyperthreading is actually beneficial. We encourage you to experiment and see what works best for you. NOTE: The countdown clock on the front page uses the host computer time. Therefore, if your computer time is off, so will the countdown clock. For precise timing, use the UTC Time in the data section at the very top, above the countdown clock. Scores will be kept for individuals and teams. Only tasks issued AFTER 3rd April 2018 12:00 UTC and received BEFORE 8th April 2018 12:00 UTC will be considered for credit. We will be using the same scoring method as we currently use for BOINC credits. A quorum of 2 is NOT needed to award Challenge score - i.e. no double checker. Therefore, each returned result will earn a Challenge score. Please note that if the result is eventually declared invalid, the score will be removed. We kindly ask users "moving on" to ABORT their tasks instead of DETACHING, RESETTING, or PAUSING. ABORTING tasks allows them to be recycled immediately; thus a much faster "clean up" to the end of an LLR Challenge. DETACHING, RESETTING, and PAUSING tasks causes them to remain in limbo until they EXPIRE. Therefore, we must wait until tasks expire to send them out to be completed. Wacław Franciszek Sierpiński (14 March 1882 - 21 October 1969), a Polish mathematician, was known for outstanding contributions to set theory, number theory, theory of functions and topology. It is in number theory where we find the Sierpinski problem. Basically, the Sierpinski problem is "What is the smallest Sierpinski number" and the prime Sierpinski problem is "What is the smallest 'prime' Sierpinski number?" First we look at Proth numbers (named after the French mathematician François Proth). A Proth number is a number of the form k*2^n+1 where k is odd, n is a positive integer, and 2^n>k. A Sierpinski number is an odd k such that the Proth number k*2^n+1 is not prime for all n. For example, 3 is not a Sierpinski number because n=2 produces a prime number (3*2^2+1=13). In 1962, John Selfridge proved that 78,557 is a Sierpinski number...meaning he showed that for all n, 78557*2^n+1 was not prime. Most number theorists believe that 78,557 is the smallest Sierpinski number, but it hasn't yet been proven. In order to prove it, it has to be shown that every single k less than 78,557 is not a Sierpinski number, and to do that, some n must be found that makes k*2^n+1 prime. The smallest proven 'prime' Sierpinski number is 271,129. In order to prove it, it has to be shown that every single 'prime' k less than 271,129 is not a Sierpinski number, and to do that, some n must be found that makes k*2^n+1 prime. Should both of these problems be solved, k = 78557 will be established as the smallest Sierpinski number, and k = 271129 will be established as the smallest prime Sierpinski number. However, this would not prove that k = 271129 is the second provable Sierpinski number. Since the prime Sierpinski problem is testing all prime k's for 78557 < k < 271129, all that's needed is to test the composite k's for 78557 < k < 271129. Thus, the Extended Sierpinski Problem is established. (Edouard Lucas: 1842-1891, Derrick H. Lehmer: 1905-1991, Hans Riesel: 1929-2014). Do you have app_config instructions for linux? Are they needed for Linux? Message 116465 - Posted: 27 Mar 2018 | 5:37:14 UTC - in response to Message 116464. You wrote name of this mathematician a bit incorrectly - special Polish characters are changed to their closest Latin equivalents. His name should be written as "Wacław Franciszek Sierpiński" (I bolded two changed letters). I'm in for this one. Also it ties in better with my sequential turquoise plan. Message 116474 - Posted: 27 Mar 2018 | 12:44:12 UTC - in response to Message 116466. Excellent! I love this kind of feedback. Change made to my original Welcome post. Message 116475 - Posted: 27 Mar 2018 | 13:03:31 UTC - in response to Message 116464. Welcome to the Challenge. Start times are shared around as participants are located all over the globe. I am more open to alternate times than most, as I am GMT+8, Perth. I am sensitive to what works for most of the people. Trying to draw the biggest crowd is always a juggling act. Have a look at the Challenge Schedule for 2018. I think I've given the start times a fair spread. Message 116482 - Posted: 27 Mar 2018 | 16:48:07 UTC - in response to Message 116474. Message 116487 - Posted: 27 Mar 2018 | 19:24:03 UTC - in response to Message 116475. Trust me to pick this challenge as my first!!! Message 116492 - Posted: 27 Mar 2018 | 20:27:46 UTC - in response to Message 116487. So, for the challenge, do I want to do as many tasks as possible - option 2 or do I want to complete a task in the quickest time possible - option 3? Message 116493 - Posted: 27 Mar 2018 | 20:36:46 UTC - in response to Message 116492. ESP tasks are a lot longer, and multi-threading performance will be different with ESP than with the very short PPSE tasks. It is likely that option #3 will give you BOTH the shortest run time AND the most number of tasks done, so #3 is what will likely work best for you. Please do not PM me with support questions. Ask on the forums instead. Thank you! Message 116495 - Posted: 27 Mar 2018 | 20:50:53 UTC - in response to Message 116493. Ahhhh, Thanx Michael. I didn't think about runtimes. Message 116499 - Posted: 27 Mar 2018 | 21:42:49 UTC - in response to Message 116495.
on my i7-6700, found best PPSe performance with running 3 tasks by 2 CPUs each at the same time. Plus I can still run GPU tasks. Message 116526 - Posted: 28 Mar 2018 | 14:37:16 UTC - in response to Message 116492. Also look at it like this, knowing these are just PPSE tasks and as Michael said ESP is a lot longer and the results may not be the same. There should still be time for testing. If you use option 3, how long will it take to finish the six tasks that option 2 can finish in about 11 minutes? IFF I calculated it correctly you're looking at over 20 minutes using option 3 for those six tasks, but I wouldn't trust my math any more, so double check it. It'll definitely be longer tho. Again, this is using the times you posted for PPSE tasks. I've tested this on this computer (i7-2600) also and come up with the same results, even before I knew about multithreading. I can run certain projects faster with HT (6 at a time) than I can with HT turned off (3) at a time. Not individual tasks, but more tasks per time period (12 hours, 24 hours, 3 days...), challenge lengths. Hope this helps. The two most important things are test, test, test. And you can't take data from one project and use on another with anything like reliable results. Message 116582 - Posted: 29 Mar 2018 | 12:53:12 UTC - in response to Message 116444. I am interested in participating and tried to put the xml in the directory you gave but couldn't find it. Is it possible to just create a projects folder and stick it in there? Message 116585 - Posted: 29 Mar 2018 | 13:30:24 UTC - in response to Message 116582. If you're running PrimeGrid through BOINC, there is a folder. Have you enabled visibility of hidden & system files if need be? Message 116604 - Posted: 29 Mar 2018 | 22:12:01 UTC - in response to Message 116587. I did not have it enabled; enabling it fixed my issue. ESP's been slowly rising, from 634 tasks completed per day till 994 currently. 8 minutes till Challenge start. Let's hope for a prime! Message 116749 - Posted: 3 Apr 2018 | 12:03:45 UTC - in response to Message 116744. We found a Woodall prime in the 321 challenge. Will we see an SR5 prime in the ESP challenge? Maybe a PSP prime? Message 116763 - Posted: 3 Apr 2018 | 18:11:19 UTC - in response to Message 116749. Looks like we've eliminated one K from the Extended Sierpinski Problem during the first couple of hours of the challenge. Message 116765 - Posted: 3 Apr 2018 | 18:30:15 UTC - in response to Message 116763. It's so bonkers that it happened right at the start too. Someone keeping to ESP while everyone was busy with 321 could have maybe gotten it. Message 116768 - Posted: 3 Apr 2018 | 19:33:09 UTC - in response to Message 116766. It was returned within 4 hours of the start. It was sent out in the first 10 minutes of the challenge, and the prime finder and the wingman got the task within seconds of each other. That being said, if it weren't for the challenge, that task wouldn't have been sent out for another week or two. Even with large tasks like these, thousands of tasks get sent out in the first few minutes of a challenge. Message 116776 - Posted: 3 Apr 2018 | 23:04:06 UTC - in response to Message 116763. Message 116778 - Posted: 4 Apr 2018 | 0:22:48 UTC - in response to Message 116768. GDB is the double checker. Message 116780 - Posted: 4 Apr 2018 | 2:02:10 UTC - in response to Message 116779. How are the chances of reopening ESP SV looking like with one less k in the pipeline? Message 116781 - Posted: 4 Apr 2018 | 2:26:18 UTC - in response to Message 116780. Don't forget we would be finding fewer factors with one less K. The sieve, if it speeds up at all, won't speed up enough to make up for finding fewer factors. So we're even more optimally sieved than before, and less likely to want to reopen the sieve. Eliminating K=193997 at the beginning of the challenge will push ESP even a bit more because we will process a bit more candidates for remaining K's. Last K was eliminated in early 2015, it was first mega-ESP back then. Message 116789 - Posted: 4 Apr 2018 | 9:40:16 UTC - in response to Message 116779. The current leading edge (i.e., latest work unit for which work has actually been sent out to a host) is n=11572832. The leading edge was at n=11413664 at the beginning of the challenge. Since the challenge started, the leading edge has advanced 1.39% as much as it had prior to the challenge! Participation is great! Can we find a SECOND prime??? Message 116799 - Posted: 4 Apr 2018 | 13:27:00 UTC - in response to Message 116794. The current leading edge (i.e., latest work unit for which work has actually been sent out to a host) is n=11572832. The leading edge was at n=11413664 at the beginning of the challenge. Since the challenge started, the leading edge has advanced 1.39% as much as it had prior to the challenge!? I've always had a question about this in your updates and I'm finally going to ask. When you say the leading edge has advanced X% as much as it had prior to the challenge, are you saying that since PrimeGrid started working on the project, PrimeGrid has completed 100% of the work completed with X% of that happening since the challenge started? And 100% minus X% completed prior to the challenge? I think that's what you're saying, but I also feel like I'm misunderstanding something? Can you confirm or correct? Message 116800 - Posted: 4 Apr 2018 | 13:44:05 UTC - in response to Message 116799. It's a very simplistic calculation. If the leading edge was at 2 million at the start of the challenge, and it's now at 3 million, then the increase is 50%. It is not "work" that's being measured, only the increase in the value of the leading edge. Have you stopped sending out new work with multiplier 193997 already? At what time did that happen? I think the tasks related to 193997 that have already been sent out, will still finish normally? And if no second work unit has been sent yet, or if results are inconclusive, you will still keep sending out work with the relevant n and with k=193997 until the status of each task is certain? Message 116810 - Posted: 4 Apr 2018 | 15:53:18 UTC - in response to Message 116807. * Generation of new WUs was suspended as soon as we saw the unverified prime. * Existing WUs which have an active task, i.e., at least one task which was sent to a user, will complete normally, including sending out replacement tasks if necessary. * Jim went the extra mile and killed already generated WUs which had not yet sent any tasks to users. That removed about 200 tasks from the ready-to-send queue. 190 are currently in progress. Of these 190, 86 have a lower N than the prime, and 104 have a higher N.
Also, there are zero tasks with k=193997 waiting to be sent to users at this time. "Candidate" is a number to be tested. A "Workunit" is created on the server to process the candidate. Each workunit sends out 2 or more "Tasks" until at least 2 tasks return matching results. Message 116815 - Posted: 4 Apr 2018 | 16:30:15 UTC - in response to Message 116810. Thanks for the detailed reply. It was like I expected. I shall try to use the terms "task" and "workunit" in the same sense as above, in the future, for the sake of easier communication. Message 116816 - Posted: 4 Apr 2018 | 16:39:07 UTC - in response to Message 116815. I can't remember whether if we had our choice we'd eliminate a low or high weight k. Can someone remind me which we prefer and why? Message 116817 - Posted: 4 Apr 2018 | 16:53:44 UTC - in response to Message 116816. In the long run, it doesn't matter at all because we need to find a prime for each remaining K. No matter the order of discovery, the same amount of work needs to be performed. Since PrimeGrid began, we have found 11 primes larger than 3 million digits. Three of them have been found in the last 15 days. Message 116823 - Posted: 4 Apr 2018 | 19:17:13 UTC - in response to Message 116816. Knocking out 202705 would be very good, it has many more candidates that other K's. The thing with the numbers that we are looking at is, the smallest primes eliminate giant sections of the candidates. For example, let's consider, say k=55459 (from SOB). numbers 55459*2^n+1 are obviously all odd, never divisible by 2. But how about division by 3? For the sequence 2^0, 2^1, ..., 2^n, ... the remainders from division by 3 would be either 1 or 2. Obviously, they're gonna be periodical. 55459 mod 3 = 1, so k*2^n mod 3 is switching 1 and 2, so k*2^n+1 is switching 2 and 0. In other words, every second number is divisible by 3. That is – we only need to study n = 2m, because for n=2m+1 the number is divisible by 3. Next: let's check divisibility by 5? 2^(2m) mod 5 = 1, 4, 1, 4, ... Since 55459 = 4 mod 5, those 1s are making the whole number k*2^(2m)+1 = 0 mod 5. So divisor 5 eliminates half the candidates again, leaving us with n = 4m+2 now. If you check divisibility by the next primes, it might be that neither remainder causes the whole number's remainder to become 0 (i.e. the remaining candidates are never divisible by this small prime), or it might again remove every 2nd or every 3rd or every nth candidate. If two primes remove for example all 3m+0 and 3m+1, that we can rewrite the n as 3m+2. Together with previous n=4m+2 we get 4(3m+2)+2 = 12m+10. It all depends on what remainders K has. It might happen that we get all the options removed. That's how you get a Serpiensky number, and the primes that knocked out all the candidates is the covering set. However, the "periods" of 2^n mod p sequences become larger and larger (I'm not going to get into that right now), so if you weren't "lucky" in the beginning, you're not getting rid of large enough sections (like every 2nd, every 3rd) any more. A prime 5912697221 would only remove every 5912697220th n. So the things are very different for different k's in the beginning, but mostly the same for larger factors removed when sieving. If you look at the numbers in your tasks, you'll see that n's are, obviously, of these forms. It's not a big deal actually, when sieving, "the rest" are removed in the first milliseconds. But it's still a fun thing to grasp. As you can see, for 202705, only half are removed by that form, while for something like SOB 22699 only 1/72th is remaining. Thus 202705 has many more candidates to test. I hope this post is comprehensible enough. I've been meaning to gather all my thoughts on this into an educational math video of some sort, maybe one day I'll get to it. In this post omitted A LOT of what I want to talk about too. It's fun stuff. Message 116824 - Posted: 4 Apr 2018 | 19:53:56 UTC - in response to Message 116823. Awesome response! THANKS! I had no idea why some were high and some were low weight, just knew that they were. But I'm still not sure I'm sold on which we'd rather eliminate. . . It eliminates a ton of candidates, and allows us to get to a higher n faster. Each check at a given prime value has roughly the same chance of being prime, and takes a similar time to check. We like the high weight because it gives us more chances to find a prime without the computation getting substantially more difficult. If it's going to take 10,000 tests to find a prime on each of them, the 10,000th test is going to be a lot harder on a low weight. In the end, it's probably a wash, and we have to find all of them anyway so it's just good to have another k down. Message 116830 - Posted: 4 Apr 2018 | 23:13:37 UTC - in response to Message 116823. Message 116854 - Posted: 5 Apr 2018 | 14:13:16 UTC - in response to Message 116824. That's a very good point. I wasn't thinking about this, but I'm gonna agree with you. It would indeed be easier if we'll have to check the smaller numbers the longest. But for proving the whole conjecture overall. My gut feeling, not backed by anything, is that some of those last primes are hiding in much, much larger n's. For reference, we're around n~11.5M in ESP right now, and I'm talking about some prime in 100M, or in 10G. It's gonna be a while! The current leading edge (i.e., latest work unit for which work has actually been sent out to a host) is n=11651526. The leading edge was at n=11413664 at the beginning of the challenge. Since the challenge started, the leading edge has advanced 2.08% as much as it had prior to the challenge! The current leading edge (i.e., latest work unit for which work has actually been sent out to a host) is n=11717413. The leading edge was at n=11413664 at the beginning of the challenge. Since the challenge started, the leading edge has advanced 2.66% as much as it had prior to the challenge! Two days left; can we eliminate a second k? Message 116879 - Posted: 6 Apr 2018 | 13:31:16 UTC - in response to Message 116870. The challenge wasn't even advertised in my team forum. Maybe a large number of PrimeGriders have been reluctant to abort running-on long tasks. Message 116883 - Posted: 6 Apr 2018 | 14:46:55 UTC - in response to Message 116879. Indeed, while the overall participation (amount of tasks done) is excellent, the number of individuals participating is down a bit. It's not obvious why this would be. We've followed the exact same procedures for this challenge as we do for other challenges. As a rule, we don't go and "advertise" on forums other than our own. Many would consider that to be intrusive. What your own team members do is up to you, of course. Message 116891 - Posted: 6 Apr 2018 | 19:21:40 UTC - in response to Message 116883. Formula BOINC has a sprint going on for 3 days at the same time. So there are quite a few doing that right now. And it is a CPU challenge. Too bad one of these wasn't a GPU challenge so both can be run at the same time. I am going back and forth, I found running 2 CPU projects at the same time causes too many issues. Message 116892 - Posted: 6 Apr 2018 | 19:23:07 UTC - in response to Message 116891. A sprint challenge for 3 days. Well I found the edit button. lol Oh its one of those days!!!! 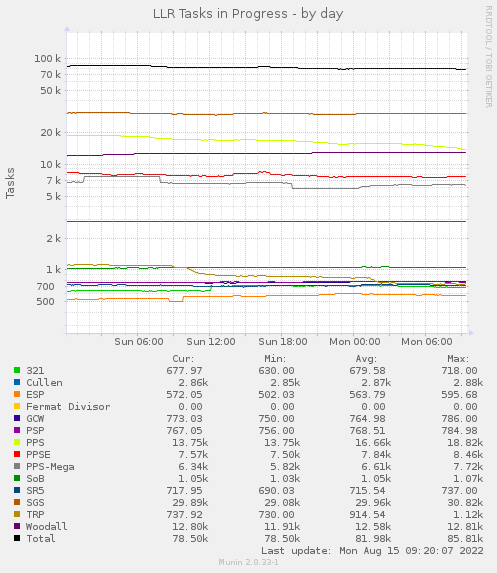 I have one Linux box doing the Formula Boinc Sprint while everything else is participating in the PrimeGrid Race. Ok, in theory there are two other machines I could have running something if I stuck them together again. The current leading edge (i.e., latest work unit for which work has actually been sent out to a host) is n=11778590. The leading edge was at n=11413664 at the beginning of the challenge. Since the challenge started, the leading edge has advanced 3.20% as much as it had prior to the challenge! Four days are done and one remains. Over fifteen thousand tasks have been returned. To put that in perspective, normal is about 200 each day. So far we've done almost exactly 20 times normal. And, of course, we eliminated one of the remaining k's. Is there another prime hiding in the last day's tasks? We would prefer users "moving on" to finish those tasks they have downloaded, if not then please ABORT the WU's (and then UPDATE the PrimeGrid project) instead of DETACHING, RESETTING, or PAUSING. ABORTING WU's allows them to be recycled immediately; thus a much faster "clean up" to the end of a Challenge. DETACHING, RESETTING, and PAUSING WU's causes them to remain in limbo until they EXPIRE. Therefore, we must wait until WU's expire to send them out to be completed. Thank you! The current leading edge (i.e., latest work unit for which work has actually been sent out to a host) is n=11820458. The leading edge was at n=11413664 at the beginning of the challenge. Since the challenge started, the leading edge has advanced 3.56% as much as it had prior to the challenge! ESP processing was about 20x normal, and we found the first ESP prime in over three years! How long will it take to find primes for the remaining 10 k's? There's no BOINC challenge in May. The next scheduled BOINC challenge will be an SR5 challenge in mid-June. It is likely, however, that we'll be starting a double check of some old TRP that was only single checked under "Adaptive Replication." I expect the cleanup to take 3 to 4 weeks. Apr: 8: Mathematics Awareness Month: 3789 tasks outstanding; 3608 affecting individual (271) scoring positions; 2612 affecting team (58) scoring positions. I can no longer run more than 2 CPU tasks at once??? Message 116961 - Posted: 8 Apr 2018 | 20:09:51 UTC - in response to Message 116959. Try restarting your BOINC client if you haven't already. Message 116965 - Posted: 8 Apr 2018 | 20:25:30 UTC - in response to Message 116961. Message 116967 - Posted: 8 Apr 2018 | 20:44:41 UTC - in response to Message 116959. Unless you have a CPU with 36 or more cores, those commands don't go together. How many cores do you have, and what are you trying to do? <max_concurrent tells BOINC the *maximum* number of simultaneous tasks that you want to run. In your example, it forces BOINC to always run less than 7. That doesn't mean it will run 6. It's free to run fewer. But it will never run more than 6. <avg_ncpus> tells BOINC how many CPUs it should expect this task to use. <cmdline> is telling LLR to use 6 cores. So, you're telling BOINC to use 6 cores, and you're telling BOINC the task is going to use 6 cores. Assuming you have a 6 core machine, that means BOINC is able to run 1 task at a time. The <max_concurrent> tag doesn't change anything because 1 is less than 6. If you have a 36 core CPU, then 6 tasks, each using 6 cores apiece, would run simultaneously. If you have a 42 core CPU, you would still get 6 tasks running at once because the <max_concurrent> tag would limit BOINC to running 6 tasks simultaneously. If what you want to do now is run 6 tasks simultaneously, each running on a single core, you should simply remove all three directives since this is BOINC's nominal behavior unless you tell it to do otherwise. Message 116968 - Posted: 8 Apr 2018 | 20:52:58 UTC - in response to Message 116967. You're correct Michael, I have no Idea what these commands do. Message 116969 - Posted: 8 Apr 2018 | 21:01:00 UTC - in response to Message 116968. You didn't answer what you wanted to do -- you want to run 12 tasks at once? Please note that if you're using this computer to run LLR, this is a very inefficient configuration. You'll get more tasks completed over a given period of time if it runs a single 6-core LLR task at a time, assuming they're large tasks like ESP or 321. Message 116970 - Posted: 8 Apr 2018 | 21:01:52 UTC - in response to Message 116968. Message 116971 - Posted: 8 Apr 2018 | 21:04:05 UTC - in response to Message 116970. Message 116984 - Posted: 9 Apr 2018 | 8:54:28 UTC - in response to Message 116968. Deleting app_config.xml does not restore default thread config. This is a known bug in BOINC, I reported it some time ago. You have to first configure app to use 1 thread only and reload config/restart BOINC. After doing so you can safely delete app_config.xml. Message 116985 - Posted: 9 Apr 2018 | 8:56:11 UTC - in response to Message 116984. Message 116986 - Posted: 9 Apr 2018 | 9:02:02 UTC - in response to Message 116985. Daniel you are a genius - this is something I will have to try to remember for future challenges!!! Message 116994 - Posted: 9 Apr 2018 | 11:56:58 UTC - in response to Message 116934. Apr 8: Mathematics Awareness Month: 3789 tasks outstanding; 3608 affecting individual (271) scoring positions; 2612 affecting team (58) scoring positions. Apr 9: Mathematics Awareness Month: 2162 tasks outstanding; 1586 affecting individual (238) scoring positions; 893 affecting team (40) scoring positions. Apr 10: Mathematics Awareness Month: 1427 tasks outstanding; 998 affecting individual (210) scoring positions; 379 affecting team (34) scoring positions. Apr 11: Mathematics Awareness Month: 1150 tasks outstanding; 745 affecting individual (193) scoring positions; 302 affecting team (30) scoring positions. Apr 12: Mathematics Awareness Month: 884 tasks outstanding; 537 affecting individual (166) scoring positions; 77 affecting team (23) scoring positions. Apr 13: Mathematics Awareness Month: 562 tasks outstanding; 288 affecting individual (119) scoring positions; 20 affecting team (10) scoring positions. Apr 14: Mathematics Awareness Month: 417 tasks outstanding; 190 affecting individual (91) scoring positions; 14 affecting team (7) scoring positions. Apr 15: Mathematics Awareness Month: 300 tasks outstanding; 132 affecting individual (66) scoring positions; 11 affecting team (5) scoring positions. Apr 16: Mathematics Awareness Month: 207 tasks outstanding; 89 affecting individual (51) scoring positions; 5 affecting team (4) scoring positions. Apr 17: Mathematics Awareness Month: 126 tasks outstanding; 38 affecting individual (32) scoring positions; 4 affecting team (3) scoring positions. Apr 18: Mathematics Awareness Month: 94 tasks outstanding; 22 affecting individual (21) scoring positions; 2 affecting team (2) scoring positions. Apr 19: Mathematics Awareness Month: 62 tasks outstanding; 14 affecting individual (14) scoring positions; 1 affecting team (1) scoring positions. Apr 20: Mathematics Awareness Month: 42 tasks outstanding; 8 affecting individual (8) scoring positions; 1 affecting team (1) scoring positions. Apr 21: Mathematics Awareness Month: 33 tasks outstanding; 6 affecting individual (6) scoring positions; 1 affecting team (1) scoring positions. Apr 22: Mathematics Awareness Month: 25 tasks outstanding; 2 affecting individual (2) scoring positions; 0 affecting team (0) scoring positions. Apr 23: Mathematics Awareness Month: 23 tasks outstanding; 2 affecting individual (2) scoring positions; 0 affecting team (0) scoring positions. Apr 24: Mathematics Awareness Month: 20 tasks outstanding; 2 affecting individual (2) scoring positions; 0 affecting team (0) scoring positions. Apr 25: Mathematics Awareness Month: 17 tasks outstanding; 2 affecting individual (2) scoring positions; 0 affecting team (0) scoring positions. Special congratulations to tng* for finding the prime 193997*2^11452891+1 and so elimiating one of the ESP k's! Congratulations to the winners, and well done to everyone who participated. See you at the World Cup Challenge! Message 118700 - Posted: 16 Jun 2018 | 12:59:45 UTC - in response to Message 117512. Message 118707 - Posted: 16 Jun 2018 | 14:30:29 UTC - in response to Message 118700. Apologies, should be fixed now.